Nassau, Bahamas: “Islands of the World Fashion Week” is more than an event, it's an experience! Mode Îles Ltd, producers of IWFW, is set to launch their first music compilation “Islands of the World Fashion Week CD Vol. 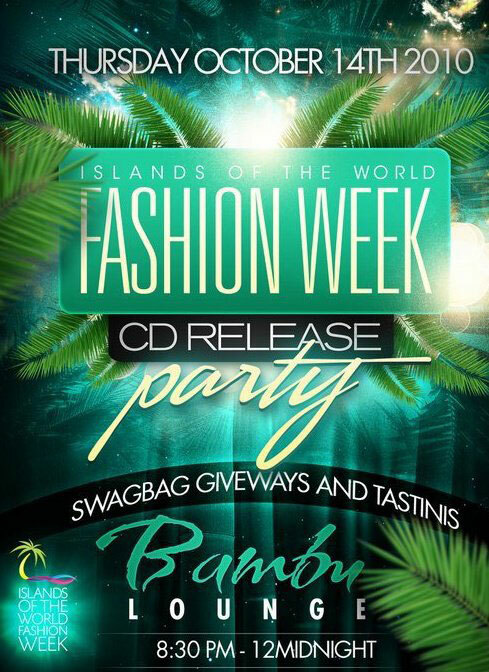 1”, with an official CD release party scheduled at Bambu Nightclub for Thursday October 21st. As this pioneering event gets ready to hit the regional and international television medium, Mode Îles Ltd saw fit to create a mix of hits ranging from techno, R&B, Pop and house. Featured artists on this eclectic musical compilation hail from countries like Trinidad, British Virgin Islands, Canada, U.S.A., Europe and The Bahamas. Radio hits from around the region like “Let Me Know” and “Push It”, are just some of the tracks that listeners can groove to.There is also “home grown” flavor on the compilation, with songs from “Sketch” and “TADA”. This event is sure to transcend you into the world of high fashion, as guest will lounge in the transformed, ultra chic lower level lounge and enjoy exotic “tastinis” and conversation. As the “sounds of the runway” echo from the rooftop oasis, guest will join a party in progress, with songs from “Islands of the World Fashion Week CD Vol. 1” and #1 mixes of today. Attending guests including IWFW models, socialites and fashionistas will leave the party with “swag bags” filled with the “IWFW CD Vol. 1” and gifts courtesy of IWFW 2010 sponsors. One of the CD's Executive Producers, Alexander Blaze boasts, “This amazing CD has been designed to showcase new musicians in conjunction with the hottest fashion event, Islands of the World Fashion Week”. The CD is for promotional purposes only and is not for sale. All of this and more prepares guest for the hottest fashion runway to hit the region on November 11-13, 2010 at the British Colonial Hilton, Nassau, Bahamas.